Billy Graham's home, just as it was. Building on left. 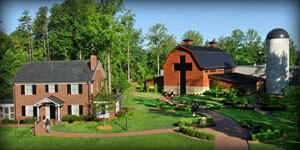 Have you visited the Billy Graham House Museum? The site is officially called The Billy Graham Library, and there is a library, but it is much, much more than that. Even those not overly fond of Mr. Graham will find the trip to the house and grounds in Charlotte, North Carolina well worth it. I was there two summers ago with my husband, two daughters and some friends who had just moved to the area. Even before entering the home, visitors are greeted outdoors with lovely hymns, as if an angel choir is hovering about somewhere. It turns out that the music is wafting out of hidden speakers, and these are scattered about the walking paths so that one is never too far away from the peaceful, happy sounds. On a beautiful day, you might think you're on heavenly grounds! 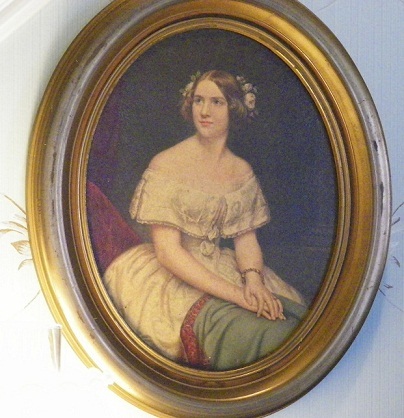 As you enter the house, it is immediately apparent that Mrs. Graham (not Ruth Bell Graham, Billy's wife, but his mother) had an eye for tasteful decor. I couldn't help snapping photos as we moved along. We were only given access to the first floor rooms, and even some of them were tantalizingly roped off so that you couldn't see the whole room. (Must be what makes me an avid researcher for my novels--a really well developed sense of curiosity!) Those we could view, however, were lovely. The kitchen was small and definitely low-tech. Not a granite countertop in sight, but it had the winsome charm of days past, which is what I enjoyed throughout the home. Georgian Vignette. I could not get this photo without the reflection, much as I tried. Once you complete the short tour of the homestead, you follow the path, still enjoying the hymns along the way, to the Barn. This is where the real tour begins, with state-of-the-art animatronics in the huge reception room and bookstore, where it all starts. There is no charge for any of this, by the way. Admission is free, which is a delightful surprise, considering the cost of even small museums, today. Once you listen to an animatronic cow give you a little amusing introduction, you follow a mostly self-guided tour from room to room. "Self-guided," because no one rushes you, but there is a presentation or short film in most every room, so that, even though no one is moving you along, the tour goes in order of Mr. Graham's life, and you learn, not only about him and where he traveled to preach the Word of God--these things seem almost incidental--but about the various countries he went to. There is political, social, and spiritual information, so you don't feel as though it is all about him. Instead, it is a great testimony of what God does with a willing soul, and even a history lesson for anyone willing to listen, read, and learn. Exhibits range from written paraphernalia, pictures, films, recorded excerpts, artwork, and a couple rooms full of personal artifacts, letters, and other things of interest. I don't think I spent a boring moment. Then, at the very end of the tour, we went through a wonderful doorway, which (if I remember correctly) is meant to represent the door we all hope to pass through one day--the gateway to heaven. (See below.) It is actually like going through a short tunnel--fun! At the end: The Gateway. " "I am the way, the truth, and the light. No one comes to the Father except through Me." For more information on the Billy Graham Library, hours of operation, and more, see the website HERE. 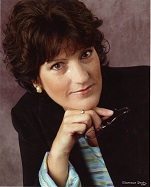 Linore Rose Burkard is best known for historical romance novels with Harvest House Publishers, and now writes YA/Suspense as L.R.Burkard. Linore teaches workshops for writers with Greater Harvest Workshops in Ohio, is a mother of five, and still homeschools her youngest daughter—preferably with coffee in one hand, iPad in the other, and her feet up. Keep up with Linore by subscribing at either of her websites. I haven't been there, Linore. I didn't even know it existed, so thanks for the post. I'd love to visit the historical home. I've never been there before, but I'd love to go. I have been to another house museum, though. Pearl Buck's birthplace in Hillsboro, WV. It's a nice place to visit. Graham and Buck are on our Bucket List. Thank you for the post, Linore.